Permanently Affiliated to Savitribai Phule Pune University (SPPU), Approved by AICTE, An ISO 9001:2015 Certified College. The annual social gathering of PCCOE – "Swaratarang 2017" was celebrated on 21th and 21st Jan. 2017. The program was inaugurated by the auspicious hands of Mr. Bhaijan Kazi, member, PCET. Principal of PCCOE , Dr. A. M. Fulambarkar in his address took a review of various activities and achievements of PCCOE in the year 2016-17. 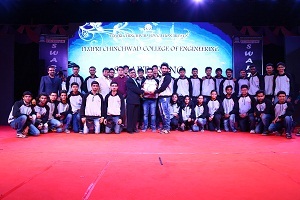 In the annual prize distribution ceremony University toppers, college toppers, winner teams of national level competitions like Enduro Student India, SAESUPRA, University and national level sports winners were felicitated . The students of PCCOE participated in the cultural program with joy and enthusiasm and exhibited their talent in singing, dancing and acting. Various events like Rangoli and hobby exhibition, Antakshri, Kavisammelan, Debate competition, Elocution competition and interdepartmental sports competition "Sangharsh 2017"were organized during this occasion. All deans, H.O.D.s of difference department, faculty members, admin staff, students, parents and alumni were present for the occasion. 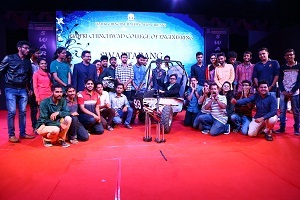 Conveyner of the program Mr. U. I. Shaikh and his team, Dr. Sheetal Bhandari (Dean SWD), student council members Mr. Akshay Garade (G.S. ), Sourabh Dhawale (C.S. ), Karan Hingmire (S.S.), Prerana Rai, Rutuja Shinde (L.R.) took special efforts to make the event memorable.